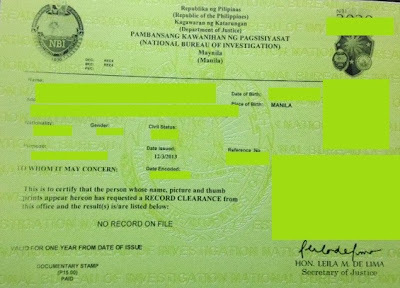 REQUIREMENTS AND PROCEDURES : HOW TO GET AN NBI CLEARANCE ONLINE? 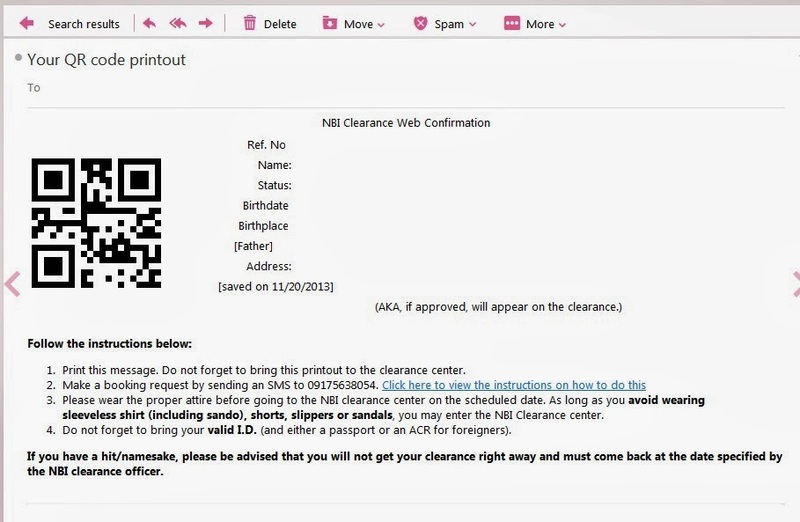 NBI Clearance is one of the most popular requirements whether for travel, jobs, certification etc. And I've read so many reviews with mixed conclusions. Some are irate as they had a bad experience, while others are happy since they got theirs in an easy peasy way. I'll be sharing with you my first hand experience on how to get an NBI Clearance. I am so happy to report that I claimed mine in less than 10-minutes! 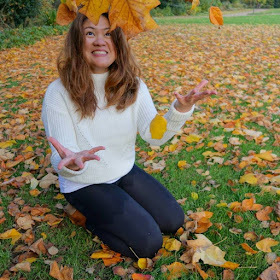 Special thanks to my friend Agnes who taught me this mighty convenient alternative. Pay your processing fee via Pinoy Pera Padala outlet. For a complete location list, click HERE. On your receipt, there's an NBI reference number. Take note of such. Log in to NBI Online Portal, click HERE. Register and confirm your email address. 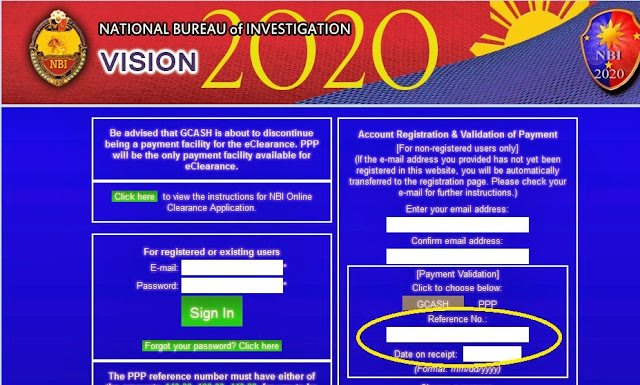 On the NBI Online Portal, input your reference number (see picture above encircled in yellow). You will receive a QR code via email. Print the email. Note: Strangely, I haven't received any confirmation even though I sent my message thrice. However, when I went to Robinsons Manila to claim my clearance, I encountered no problem at all. I claimed my NBI Clearance at Robinson's Place - Ermita Manila. For a complete list of NBI clearance outlets, click HERE. Be there 10 minutes before your scheduled time. Bring an ID with you. ♣ Tip: Wear something with sleeves, applicants wearing sleeveless won't be allowed to have their picture taken. In my case, I approached Manong Guard politely and shared to him that I have my online form with me. He looked into my printed email and escorted me to the other part of the line. I've been advised that I can proceed straight away with the picture and biometrics (electronic thumb printing) section. That's it! After less than 10 minutes, I have my NBI clearance with me. Obviously, going online is the easier way. I encourage you to use this method and spare yourself from unnecessary stress. Kindly note that on my end - I am renewing my clearance. I got this clearance last December 3, 2013. In the event that rules or processes have changed, feel free to comment below. Went to NBI Alabang branch last December 27, 2013, they said that come this Jan 2, 2014 they will no longer honor the e-nbi system they implemented because they will implement a new system. Was so disappointed and asked them what will happen to the payment made thru pinoy pera padala for the NBI clearance. And they said that it's gone and they cannot do anything about it. Why the hell did they not update their website regarding this issue. Is it a money making scheme of NBI? Also they said that their cut-off will be reduced to 300 instead of 500, so we'll be expecting a sluggish processing. I thought that fees are for the betterment of the services but what's happening? Where's the progress here? Oh.. I am sorry about your experience. Maybe it's best to call the NBI Main Office and get some help from there. I hope public service will be better sooner rather than later. Happy New Year, La!